In my last post I wrote about several wearable devices I used while studying in Germany. With all the chatter about wearable displays at Consumer Electronics Show (CES) this year I decided it’s time for a post about wearable display devices that look promising. Several of the companies making the devices have been researching and developing this technology for several years now and appear to be on the verge of creating usable devices that consumers can afford. Keep in mind there are two main purposes for these displays: media consumption and augmented reality. According to MITs Technology Review, most of the companies working on these wearable head mounted displays started out building systems for the military. My interest in wearable devices is centered around consumer products for recreation and leisure time, however it’s fascinating to see some of these companies building innovative communication products for industries like aviation and hospitality first, in order to generate enough revenue and research to get themselves into the consumer market. One of my favorite applications for wearable displays is used for augmented reality while participating in snow and dirt sports like snowboarding and dirt biking. Recon Instruments makes micro optic displays that are are completely non-obtrusive for front and peripheral vision and provide real-time information on speed, jump analytics, distance, temperature and much more. Recon’s MOD Live GPS micro optic displays snap into Recon-ready goggles and connect to Android devices (iOS coming soon) via Bluetooth. They just recently partnered with with Smith Optics and Scott sports so I’m expecting we’ll start seeing more of these on the slopes quite soon. A fellow MCDM student, Derek Walker, recently posted a video of another goggle device for snow and dirt sports that records video, takes pictures and has an in-goggle viewfinder. These won’t be available for another year, but I really like the way they’ve integrated a head mounted camera. According to their website, Lumus is the “leading enabler of wearable displays”. Their technologies are currently being used by pilots in the U.S. Air Force and U.S. National Guard. Instead of developing displays from start to finish, Lumus sells their Optical Engine Modules under OEM agreements to leading consumer electronics manufacturers, who then market lines of products integrated with Lumus technology. By doing this they have penetrated a wide range of markets but don’t neccessily have control over how their technology is being used. Vuzix won two innovation awards at CES for advanced 3D glasses and a new monocular see-through head mounted display (HMD). Their new 3D Mobile Video Eyewear looks pretty slick and connects to nearly anything with HDMI or any other type of video out. They provide a big screen experience (75″ from as seen from 10 feet away) and cost about the same as a plasma TV, $599. The new monocular see-through HMD for idustrial use is intended for things like viewing the schematics of a machine while looking at it and will go on sale later in 2012 for $5,000 to $10,000. Vuzix has been developing their display technology for military and industrial applications since 1997. In 2005 they jumped into what they call the “consumer Video Eyewear market”. The company is focused on making its video eyewear the standard mobile equipment for watching news, sports, music videos and movies, and for playing video games on the go. SmartGoggles are by far the ugliest head mounted display I’ve seen but they have some cool features including a 360 degree view, 720p display, built-in Android 4.0, head & hand tracking 3D processing, Wifi and Bluetooth. They appear to offer an immersive virtual 3D environment and use 11 cell phone cameras mounted on the front to detect hand and arm gestures allowing the person to interact with what they see. So far they haven’t announced a price but they should be available later in 2012. Sensics is also developing a see-through SmartGoggle for augmented reality applications. 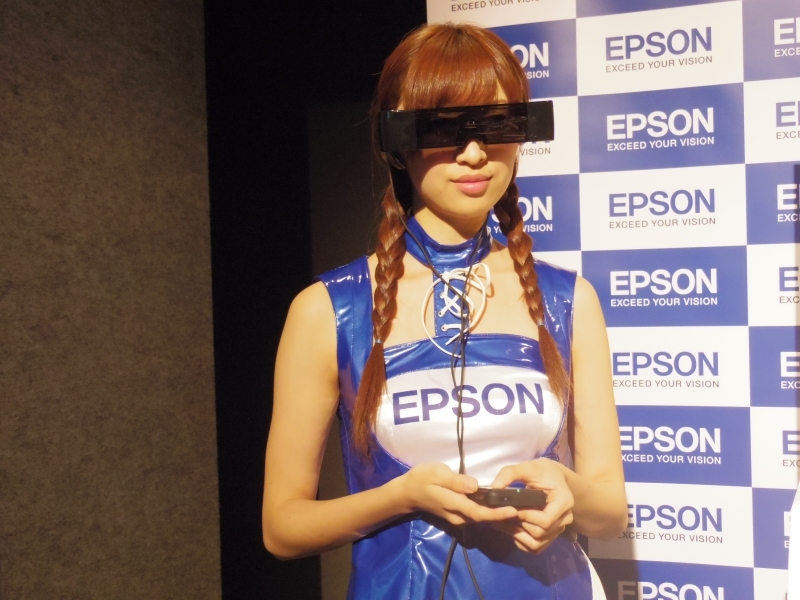 According to announcement made on Jan. 5, Sony is working on a 3D head mounted display and has already released a prototype. There’s no word on when it be available but it appears to be intended for watching videos and playing video games. The Golden-i device has been out for awhile but was on display at CES. Like Sensics SmartGoggles, the Golden-i device has a built-in processor, Bluetooth and Wifi. It runs Windows CE embedded and is controlled by gestures and voice. This device’s display sits just below your natural line of sight and appears to be 15″ when it’s in focus. These glasses didn’t make it on stage at CES, I just really like the picture. According to The Verge, they went on sale in Japan back in November for around $643. They simulate a screen that is 320″ wide from about 65 feet away at a resolution of 960×540 and have built-in Wifi. One of the things I found most interesting while researching these displays is that the software needed for augmented reality is far ahead of the hardware. The companies like Recon that are actually creating new markets have integrated software and hardware while other companies like Lumus are just focused on creating the best display. At this point it’s still hard to speculate just how viable head mounted displays will become, but if they’re anything like Bluetooth audio headsets we’re in for a major transition in how we communicate and see the world around us. Always interested in hearing your thoughts. Would you drop some cash on a head mounted display device and what features are you interested in? Have you heard of any others that looking interesting? THose Recon-ready goggles are amazing. It would be cool to see something similar to for runners/cyclists. The 8mp video camera in the Zeal Optics goggles is awesome too. I currently use a Looxcie for first-person video recording, but the quality isn’t so great. Just a comment based on my research. A big problem with Head Mounted Displays is the human eyes natural inability to focus on objects at close distances (place your hand in front of your face and see how blurry it is). There is a solution underway, which involves embedding optics into contact lenses so that eyes can focus on screens very close to the eyes, but they wont be on the market probably for another 2 or 3 years. Innovega is the name of the company developing this technology, and the lenses are called i-Optiks.